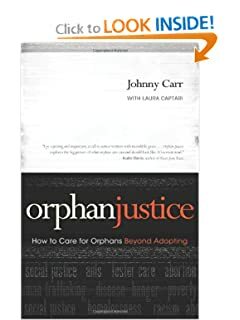 I was given the privilege of reviewing a new book (just released March 1) on orphan care called Orphan Justice…How to Care for Orphans Beyond Adopting by Johnny Carr. WOW! So far, I LOVE this book. I hope to do a short review chapter by chapter over the next month or so, but while you wait for me to finish reading the book, I strongly encourage you to purchase yourself a copy. There’s some fabulous information in this book that I haven’t found anywhere else yet. It’s almost a how to book, but better—how to care for orphans beyond adopting—for EVERY Christian, but more than that because it gives the why’s in addition to the how-to’s. Because God calls ALL of us to care for orphans! This book gives each person practical, doable ways to live out James 1:27, caring for orphans. Chapter 1 is entitled “True Religion, Orphans and My Family”. It tells a little about Johnny Carr’s family and his journey into the world of adoption, while at the same time, opens the readers eyes to the truth of God’s love for the orphan, as well as His mandate that we, as Christians, step up and do something, anything, to care for orphans in their distress. Way to spur us on, Mr. Carr! Click HERE to purchase your copy of this book today. I encourage you to read it aloud with your children. Ask God to show you how He wants you to step up to care for orphans beyond adopting. Then obey. PS If you have questions you’d like to ask the author of this book, Johnny Carr, please leave me a comment and I’ll do my best to get all questions answered.